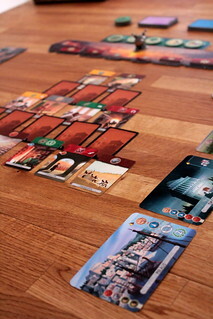 Even after five years, 7 Wonders is still one my all time favorites. It’s quick, it scales well up to seven players, it’s interactive and it sits in a good spot between having interesting strategic options and being easy enough to grasp that new players can enjoy it on their first game. It’s really doing everything right. Except the two player game, where all that simplicity breaks down with the addition of a virtual third player to make the game mechanics work. 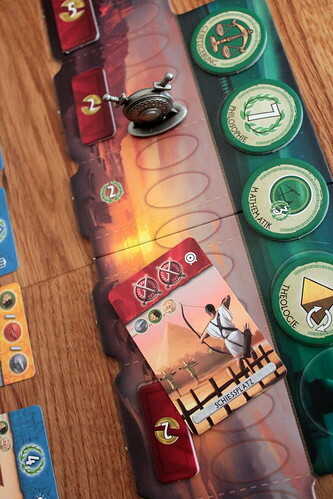 I don’t think we ever played two player 7 Wonders after we reviewed it. But now, five years later, you finally have an option to play 7 Wonders with just your favorite opponent, and that option is called 7 Wonders: Duel. As a pure two player game, and the first new standalone game in the 7 Wonders series since the original game, Duel necessarily changes a lot of things. 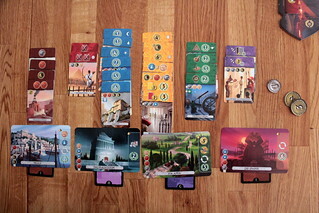 Anyone who ever played 7 Wonders will nevertheless recognize the game and quickly find their way around. Your goal is still to build an empire over three ages, with each age played with its own set of cards. The cards for the current age are laid out between the two players in a pattern specific to the current age, with some cards being face up from the start, others face down, and most cards partially covered by other cards. The player whose turn it is – because Duel is actually played in turns now – picks one of the cards not covered by anything to play. Taking a card from the pattern may uncover one or more cards for your opponent; if face down cards are uncovered they are also flipped up. This mechanic replaces the card drafting from the original game – which, frankly, doesn’t work very well in two players. This is a big change, card drafting was always the core of 7 Wonders, but in effect this new card selection mechanic is very similar: you have to balance your card needs against keeping cards your opponent needs away from him. Not only do you sometimes have to pick cards to keep them away from your opponent, you also don’t want to uncover cards that he needs. Or even uncover face down cards that might be cards he needs. After the first two games, you do start considering that. There’s a lot of strategy in the card display already, maybe even a bit more than in the original card drafting because you have more information from the start and only one other player to oppose. What you do with the cards when you picked them is familiar again. After you picked one, you have three options: discard it for coins, use it to build one of your Wonders – more on that later – or add the card to your empire. 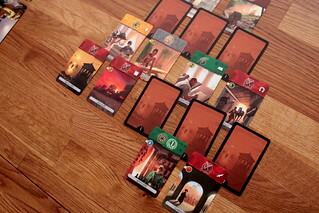 Cards for your empire follow the same color scheme as 7 Wonders, too. The most basic are cards with brown and gray backgrounds, they produce different kinds of resources. So you have Stone Pits to produce stone, Looms to produce Cloth and so on. These resources are important because most cards can only be played if you have the right resources to pay for them. You don’t discard the cards you use to pay, you just have to have them – they represent production facilities, not resources themselves. If you don’t have the resources needed for a card, you can buy them for coins. The base price is two coins for each resource, and they are always available since you’re buying from the bank. You still interact with your opponent, though, because the resource price goes up by one coin for every card producing that resource the other player has. You can’t deny an opponent access to resources, but you can make it expensive enough that he’ll have to think twice. The way around that lies in the yellow cards, which are still a grab bag of anything trade related. Most of them give you money, either a flat amount or based on something else in your display, like two coins for each brown card you have. But the yellow cards also have the stores that fix your price for the resource they show at one coin, no matter how many of them your opponent produces. Of course, if he gets the store as well, you’re still screwed. Blue cards represent cultural achievements, from Theaters to Town Halls, and give you nothing but victory points. Wait, that’s not so bad. Red cards are for the military, and here Duel works quite differently from 7 Wonders. The war at the end of each age is gone. Playing military cards now has the immediate effect of pushing the conflict marker along its track towards your enemy. The closer to your opponent it is at the end of the game, the more points it will be worth for you. Also, along the way, you get to destroy some of his money the further you push into his territory. But the real danger of the conflict marker is that, unlike previous 7 Wonder games, Duel has a sudden death option. If you ever manage to push the marker all the way to the enemy capital, the game ends immediately, victory points are completely worthless and you simply win. To actually win this way is rare, but the threat is always there so you can’t afford to ignore the military cards. If you do, it’s game over. Military is not the only alternative victory, the green Science cards can do it as well. These cards have six different symbols, and if one player collects all six he wins. Again, winning this way is rare, but the possibility forces you to keep an eye on your opponent. The Science cards have another, powerful ability that makes them useful even when you don’t have the full set. Each Science symbol shows up on exactly two cards, and collecting two cards with the same symbol lets you take a Progress Token. That’s easier for some symbols than others, because they are in the same chain. When buildings are chained together, indicated by having one building’s icon as another one’s price, then you can build the second one for free if you already have the first. In case of Science cards, that also means an instant Progress Token. These tokens have a variety of powers; the Philosophy token is simply worth seven victory points. Economy gives all the money your opponent pays for resources to you instead of the bank. Architecture reduces the cost of building your Wonders. In total there are ten Progress Tokens, but you only use five in a game. Which ones are in your game makes a big, strategic difference. And since I mentioned the Wonders above, building them is the third way to use cards. Each player has four wonders, drafted before the first age. That makes eight in total, but the game is still 7 Wonders, so one player will be in for a severe disappointment: the last wonder in play can’t be built, one player will only be able to complete three of their four. To build one of Wonders, you use any card you picked from the display and pay the price of the wonder, not the price of that card, and you gain the benefit of that wonder. On the boring but useful side, the benefits almost always include victory points and money, but some let you destroy your opponent’s stuff or have other useful effects. The most powerful of those effects is that some wonders grant you an additional turn right after you build them. That’s not only amazing because it means you play one more card than your opponent does, it also gives you the chance to uncover a card and grab it immediately, without the other player interfering. But you can’t do that often, so better make it count. Unless ended early by Science or Conflict, the game ends with the third age, after which you count victory points from your various sources and the player with the higher total wins. It takes you about 30 minutes to get there, and they are 30 tense minutes with many decisions to make. An individual turn is very quick, with two players you have virtually no down time. And you very rarely have empty moves where you decide between two cards that don’t make a difference, almost always the decision you make is meaningful for the game. Even if the cards are not useful for you, then denying your opponent cards that he wants is an important part of the game, too. With everything you do, you also interact with your opponent. 7 Wonders: Duel is a remarkable game in itself already, it keeps both players highly engaged and entertained for its full length, has strong interaction and it looks great to boot. But the most remarkable thing about it is that, despite all its differences from 7 Wonders, it feels very much the same. Instead of passing hands of cards around, you pick them from the display, but you have to make the same decisions about which cards you want versus which cards you don’t want your opponent to have. If anything, these decisions are harder because you focus on only one opponent and have more information. How you buy resources works differently, but you can still play to deny your opponent a critical resource by making it too expensive. And you still have many different ways to win, even if they are not all the same as in 7 Wonders. Duel is an excellent game, one of the best two player games available right now for me, and it works perfectly to give you your fix of 7 Wonders when you lack players.